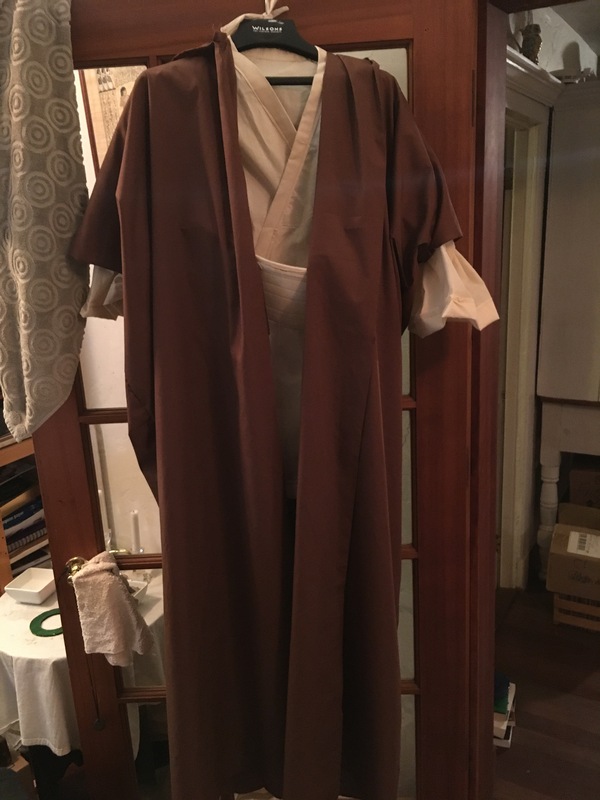 one of my Christmas presents to my cousins this year is a pair of Jedi robe costumes for their male children, who are either my nephews or my first cousins once-removed. I think it’s the latter. This was more difficult to achieve than it sounds. My first task was to create an outline of the kid in question. This was relatively easy, of course. In my family all you have to do is suggest that you’re doing an art project, and kids will help. So, I had two sheets of large poster board paper with me, and one of the kids loaned me a marker, and I traced his outline. He’ll not be the same size next year, but that’s life. This sort of thing happens, and it would be less convenient, of course, if he didn’t change size year to year. Then it was a matter of taping the two sheets of paper correctly so that I had a rough idea of how high he was from the shoulder to the knee. And from that outline, I managed to modify a pattern that I had for a Jedi robe sized for a teenager or an adult male. A boy appears to be about two sizes smaller than an adult XS size, which various websites suggest is about right. So we’re on track there. 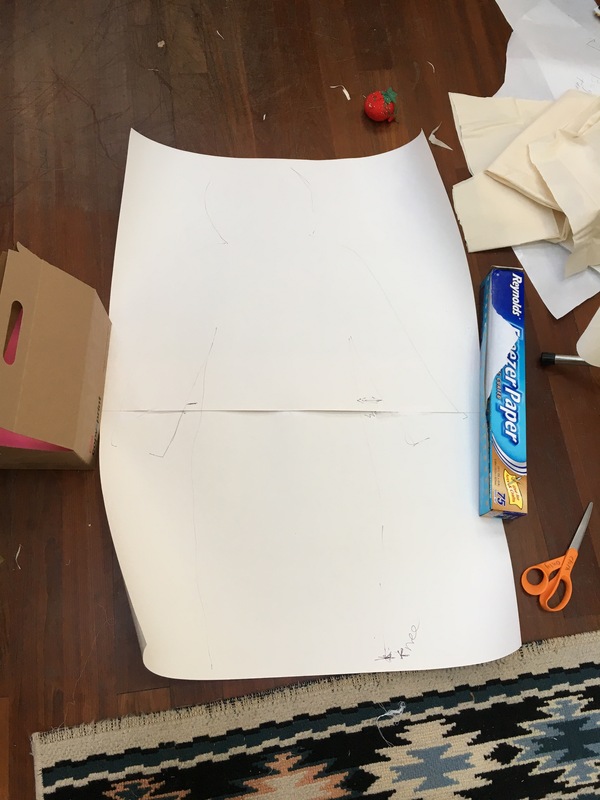 The second part of the work was making new pattern pieces out of freezer paper. I used freezer paper, rather than patterner’s paper (which has a lovely grid of dots that you can use to help mark your place and keep your pattern properly sized) because patterner’s paper is expensive, and I don’t know how long I want to keep a boys’ size 8-10 Jedi tunic pattern around; other people might want one, and having the pattern handy just makes it easier for someone to convince you to do it again. It’s kind of like the Saturn V rocket — Someone decided that project was too expensive, so most of the tools, dies, templates and even plans should wind up in the scrap heap to be melted down. Voila! No more Saturn V rockets, because who wants do do all that engineering math again at double the expense? I’ll probably keep the templates, though. It’s too useful not to. In any case, I didn’t take pictures of the cutting room floor. When you’re cutting fabric, one hand is involved in holding or maneuvering scissors, another hand is holding the fabric, and a third hand is holding the fabric tight, and a fourth hand is holding the pattern still. How I do this alone is beyond me, but I manage. It’s helpful to conjure the spirit of a good tailor during this part, even if they complain constantly about your bad cutting technique and your inadequate pinning job. Then comes the sewing itself. Each and every piece of fabric must be ironed and pressed, and then pressed again along finished seams, in order to have a really beautiful garment at the end. I was sloppy with my ironing, though. 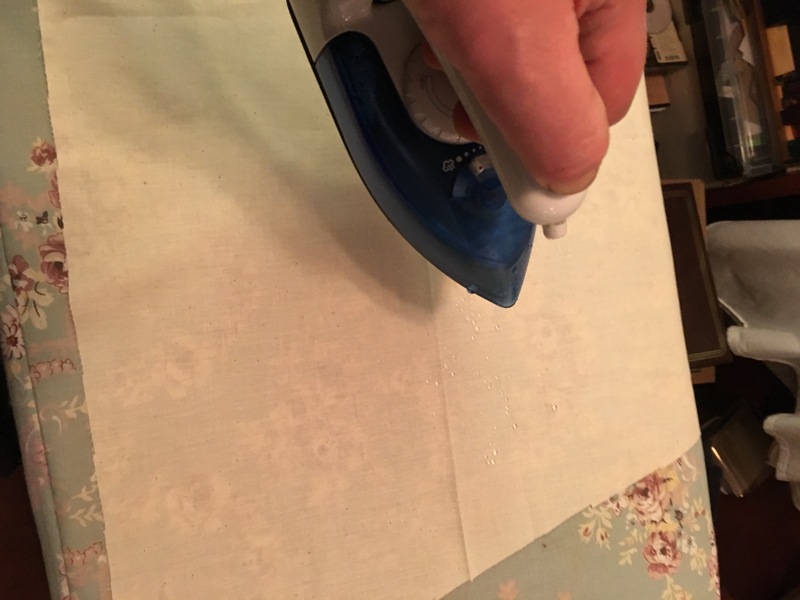 Ironing with a small travel iron, when what you want is a professional grade steam iron with a dedicated board and a hose to bring in fresh water, is difficult. 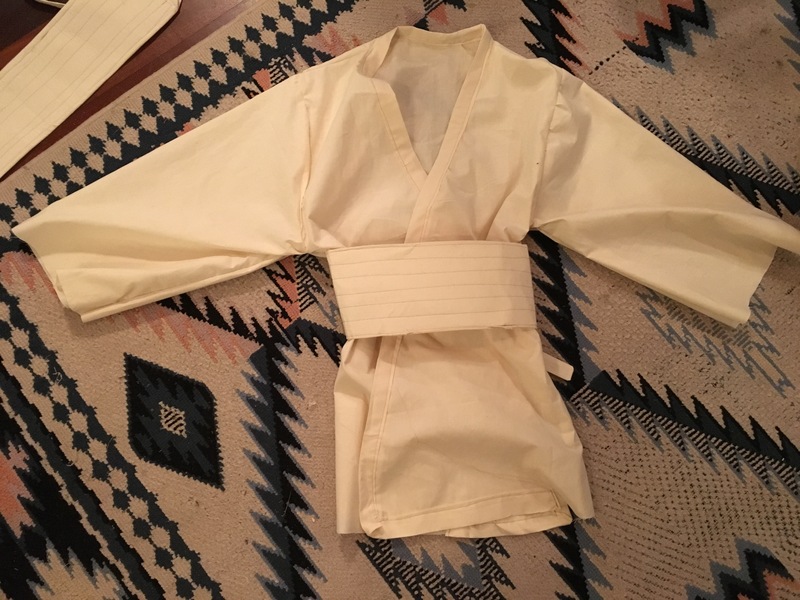 I managed OK.
A Jedi tunic is, ideally, seven seams — seven seams for seven liberal arts, seven planets in the original system of the Jedi Order (I made that up), seven virtues, seven truths, seven warnings. (that two). The front left side and the front right side are both attached to the back, each by one seam. Each sleeve is attached by one seam to the shoulders. Each sleeve and garment-side is a single seam running from wrist to waist or knee (depending on garment length). Then there’s a strip of banding or bias tape attached from the front left side in a ribbon around the neck to the front right side. Those are the seven seams. Of course, there is also some hemming (which sort of counts, and sort of doesn’t), running along the back to the side-seam; around each wrist; and across the front left and the front right. You could make up an entire spiritual mythology around the hemming of Jedi tunic garment; some nerd (me, maybe) already has, probably. Then a belt. The belts consist of heavy interfacing between two layers of fabric, and two long ties to wind around the waist. The interfacing and the two layers of fabric get a quilting, of sorts, to give them some interest and additional detail. Neither was particularly hard, although judging the roundness of the two boys from the flat pattern provided by one of them, was harder. And then the cloak. Turns out that I mis-judged the amount of brown fabric I needed, by about 4 yards. Couldn’t find the bolt of fabric in the store; couldn’t find the slip telling me the inventory number so they could look it up again. No matter. Instead of Jedi half-circle or three-quarter cloaks, I made djellabas. The djellaba is a Arabian garment, consisting of a long rectangle of fabric folded most of the way to the middle from the ends. Some holes are cut at the neck; I attached the Jedi-style hood to this opening, even though the Djellaba doesn’t normally have a hood. Hem the hood, hem the inside edges of the fabric and the tail. I might add some trim along the edges, neaten it up a bit and add some visual interest to the costume. But basically, it’s a Jedi robe outfit suitable for running around on Suburbia, the backyard planet (as opposed to the Forest Moon, or the Ice Planet, or the Urban Planet or the Swamp Planet…) I’m sure they’ll find plenty of those worlds…. As a kid, I was always taken in by the potential of costumes to transform who we are and how we think of ourselves. When I played Horatio in Hamlet, I wanted to keep my costume after the performance. The props master said I had to ask the costumer, and the costumer said no. In retrospect, it was made of the same cheap materials as this costume — but it made me into a student from Wittemberg. But if we let kids play in plastic Stormtrooper armor, it’s hard to remember to take it off. Jedi are supposed to be smart, to be agile, to be fearless, yes. But they’re also supposed to be compassionate and caring, committed to justice and the dignity of all beings. Maybe this too complicated a spell, but it’s my hope that these costumes will help raise my young cousins’ sights to the ideals beyond Star Wars, and think about what it really means to be a man of honor in a less-civilized age.